The Vicksburg varsity football team finished off Plainwell 22-7 in a game that stretched two evenings due to weather delay. The Bulldogs opened the scoring Friday night 58 seconds into the second quarter with a 50 yard power run by senior running back Nick Wallace, who shredded several tackles as he rumbled his way for six. The story of both nights was the defense that allowed yards, but prevented Plainwell points again and again. Senior linebacker Brendan Crawford came up with a key interception late in the second quarter that senior quarterback Brenden Lovell converted to points six plays later on an 11-yard scoring strike to junior wide receiver Blake Rankin. Senior running back Seth Benson was successful on both two-point after touchdown runs. At halftime the Bulldogs led 16-0, but then came the lightning. After several re-starts of the clock, officials were forced to call the game until the next evening. On Saturday, Head coach Tom Marchese said the team went through pre-game preparations for the re-start of the second half like a normal game. “We’ve gotta do what we’ve gotta do,” Marchese said of the team’s response to the weather delays faced by most teams in the Conference. The Bulldogs received the kick in the Saturday restart in the third quarter. Vicksburg went on a lengthy drive that was capped off by a 12 yard run by Wallace for a touchdown to make it 22-0. The PAT was unsuccessful. Plainwell responded with a touchdown on the next possession. The Bulldog defense made the Trojans work for every yard on the drive and it was the final score of the game. Marchese said the defense played bend but not break in the Saturday restart. It ended up being a sound strategy. Plainwell had multiple lengthy drives that didn’t amount to anything. “We had two stops on fourth down, which was nice,” Marchese said. The defense closed out the final seconds with two consecutive sacks on third and fourth down to finish off Plainwell. The Bulldogs will face Sturgis at home for homecoming this Friday. Some of the people involved in the Vicksburg Arts Collaborative that now will move to the Vicksburg Cultural Arts Center. Seated from left to right: Mary Marshall, Helen Kleczynski, Leeanne Server, Stella Shearer. 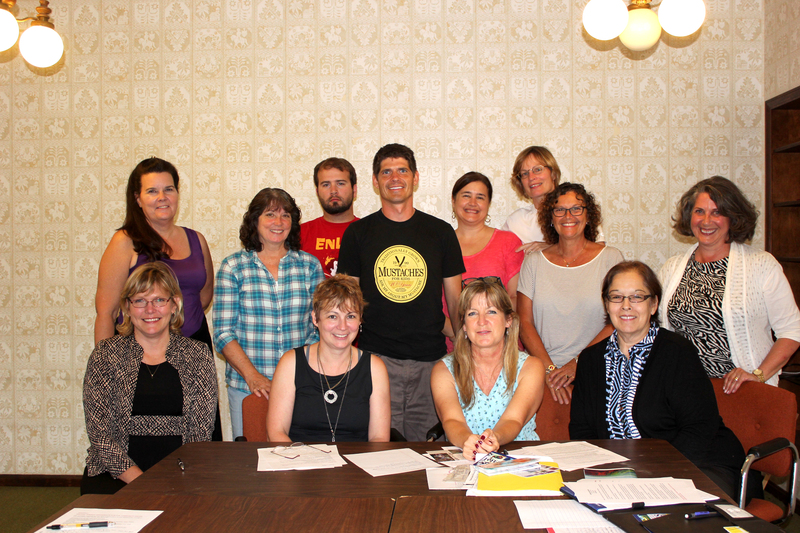 Standing from left to right: Kathleen Hoyle, Cindy Cross, Josh Harrison, BenJammin, Dina Vibert, Kim Marston, Ruthie Dorrance, Carman Sweezy. The September premiere event also showcases readings by authors including Kathleen Oswalt Forsythe with the Lake Effect Writers Guild. Contemporary jazz by Kalamazoo’s Nicholas Baxter and Jordan Hamilton underscores the finale of spoken art performance by Kelsey “KFG” Foster-Goodrich, winner of the All Talent Competition at The Mix. For more information on volunteer opportunities, on how to become a VCAC featured artist, on the launch event, and the VCAC activities being scheduled for the rest of 2015, email seaver@vicksburgarts.com or visit the website www.vicksburgarts.com. • Creativity with Paper Crafting w/ Diane Kipp from Stampin’ Up. Sept. 14, 21, & 28, 1-3 p.m.
• I Bought an iPad…Now What? w/ Dawn Pincumbe. Sept. 22, Oct. 20, & Nov. 17, 12-2 p.m.
• Connecting Threads, Ancient to Modern w/ Georgia Kline. Oct. 19, & 26, 9-11 a.m.
Students may register online at wmich.edu/olli, by phone with a credit card at (269) 387-4200, or in person by going to room #3202, on the third floor of Ellsworth Hall on the WMU campus. At the Vicksburg library, Leeanne Seaver, director of the Vicksburg Creative Arts Center, is teaching a creative writing workshop on Wednesdays 10/7, 10/14, and 10/21 from 1-3 p.m. The course is entitled “Let Her Scream,” and will explore how to let words scream, tiptoe, plow, nourish, rage, massage, provoke, dance, induce and paint, according to Seaver. Class members will be writing, sharing and producing a finished piece that will be published a small chapbook during the last lesson. 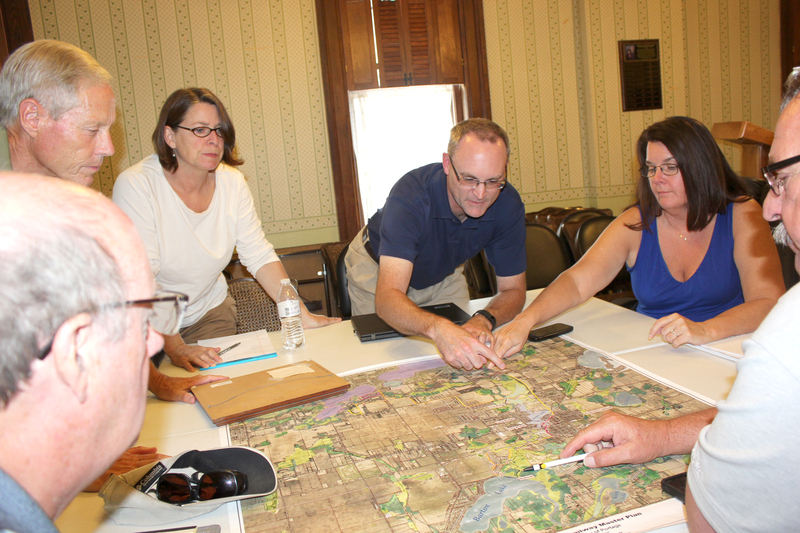 From left: Ron Smith, Bill Deming, Julie Merrill, James Earl, Kathleen Hoyle, and Ken Schippers review the map of the proposed trail through the village of Vicksburg. Raising $2.7 million in donations is a huge stretch for Vicksburg’s Downtown Development Authority (DDA). No other capital campaign in Vicksburg has ever attempted to raise that much money, according to Kathleen Hoyle, DDA director. Can it be done in the short time frame she and the board have to match potential grants applied for from the state of Michigan? Hoyle is confident it can be done, because in her two years at the helm, she has seen the tremendous commitment of Vicksburg area citizens. “Our residents in the greater Vicksburg area show great pride in their community and the quality of life it represents,” she said. The projects total an estimated $7.3 million to build another stretch of the trail through the village, widen the sidewalks downtown, beautify the area with planters, seating and upgrade parking lots with striping, lighting, and shrubbery. “The results of this campaign will not only benefit the Vicksburg area. We see this as having a strong economic impact in the entire south county area,” Hoyle said. Hoyle and the DDA board, along with Village Manager Ken Schippers and Village President Bill Adams, have spent all year planning the trail course and obtaining letters of endorsement for easements from landowners. The major portion of the grant dollars for the trail would come from the Department of Transportation (MDOT) with a smaller amount requested from the Department of Natural Resources. Hoyle has been in constant contact with the decision makers in Lansing and believes that the DDA stands a really good chance of being approved some time in November. If that happens according to plan, the timeline for having the matching funds in hand must be before the end of the year. That’s the reason for the big push for the capital campaign in September and October, she said. Hoyle and Adams went knocking on doors in August to set up campaign committees. Their persuasiveness convinced the following citizens to take an active role in the campaign: Ted Vliek, Historical Society president, and Kristina Powers Aubry, past president of the Historical Society as co-chairs. Their campaign cabinet consists of Ron Smith, family division; Bill Adams, foundation division, Steve McCowen, special gifts division; Gary Hallam, business division; Steve Goss, vendor division; and Mary Ruple, community division. Their base of support includes over 80 volunteers to raise funds. If the grants are awarded, there is a lot of preliminary work to be done with permits needed from the Department of Environmental Quality (DEQ) which would be good for one year and a half. The trail itself would be 10 feet wide, with an asphalt base. A trailhead is planned where people can park cars, get maps, or sit and rest. Bathroom facilities are in the plan to be built on Historical Society property, just east of the current trail. If all goes well, some construction could start in fall of 2016, with the major portion of the trail to be completed in 2017, Hoyle says. After that, she expects to go full steam ahead with the downtown renovations. Administrators gather before school in Schoolcraft. 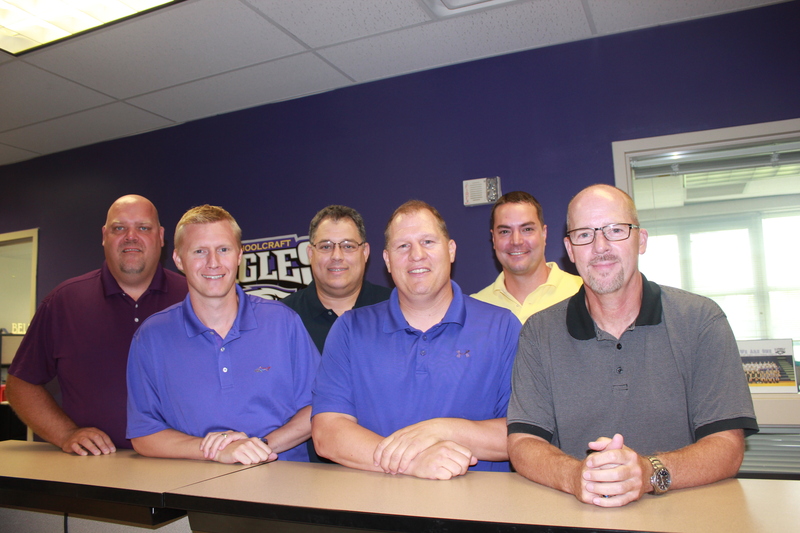 From left: Rusty Stitt, superintendent; Matt Webster, elementary principal; Ric Seager, high school principal; Jeff Clark, athletic director; Chris Ebsch, early elementary principal/technology support; Dave Powers, middle school principal. Returning students in Schoolcraft will see a host of new faces at the administration level this year with changes everywhere except at the top. Superintendent Rusty Stitt will start his fourth year at the helm. New middle school principal, Dave Powers, comes from Hudsonville near Holland, where he served as principal. He lives in Battle Creek so this will be a closer drive and a new challenge. “I’ve immersed myself in the Schoolcraft culture and climate already, and find that wonderful things are happening here. With the Leader in Me program introduced by Amie McCaw, I find the students have learned to take ownership of their life, where the teachers are not the taskmasters, they have become the facilitators. They can help students get ready for vocations we don’t even know exist today,” he said. Chris Ebsh, who was the middle school principal, has moved to the early elementary to work with Amie Goldschmeding and take charge of technology support throughout the system as director of innovation in teaching and learning. Ric Seager, the high school’s principal is not quite as new, since he started mid-year in 2014-15, replacing Kristin Flynn. There have been five different principals in four years, so he said it was important to respect the work done before him by being deliberate about any changes. “I’ve been able to identify where the challenges are and put an emphasis this year on our Middle College offering that Schoolcraft pioneered as part of KRESA’s desire to offer students an associate’s degree from KVCC through four years of high school and one year of advance degree studies in arts and letters. There is a significant cost savings to the students if they choose to go in this direction,” he said. Ebsch started the pioneer offering in the middle school by planting the seed in 2014-15. Students will be able to move into high school, already thinking about what career path they might like to take. He uses the analogy of a tree with a sturdy trunk, which has branches reaching out in several directions. “It matters that the student in this program is on a path with the tree trunk being the solid foundation and the branches offering a strong skill set, to be sure of what is needed in the work world,” he said. There is another big change at the high school level with Jeff Clark as athletic director, taking over for Doug Flynn who was AD for two years. Clark is the middle school science teacher and will continue in that role while taking over as AD half days. He also coached in the middle school so is familiar with what the coaches need in the way of support. “The life lessons learned on the on the athletic field will be useful in the student’s career later in life because of the successes they have had in Schoolcraft’s athletics,” he pointed out. Since Schoolcraft has gone all electronic with iPads throughout, the next step was to build a course management system online, according to Ebsch and Seager. Students, parents, and teachers will now have resources electronically at their fingertips. This includes the ability to turn in assignments electronically with weekly learning targets set out by their teachers online. Grades for all assignments will be posted online. Students will be able to message their teachers and take tests online as well. “They will be able to get quicker feedback from teachers with these tools that help students and parents. It’s a journey in the learning process,” said Clark. Getting ready for the back-to-school crowd, the Schoolcraft PTO parents and kids did some weeding, cleaning up, spreading mulch and raking the grounds. 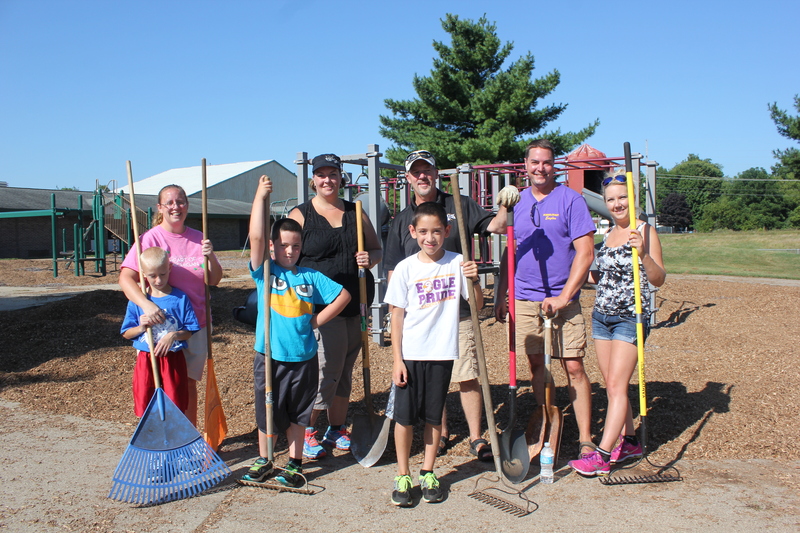 It was their annual Beautification Day with volunteers laying tons of mulch at the two elementary school playgrounds. Riley Skrzypek, the son of Matt and Julie Skrzypek of the Vicksburg area, has made the Dean’s List for the June 2015 session in the College of Applied Technologies at the University of Northwestern Ohio located in Lima, Ohio. Full-time students must receive a grade point average of 3.5 or better to be named to the Dean’s List.